If you're ready to kick up the performance level of your Wildcat Sport or Trail, we've stuffed a whopping 10% power upgrade into our slip-on muffler (without a fuel controller!). Now, we don't determine our power increases through computer models, nope. We ran it through the paces on our dyno, back-to-back with the stock and two competitor mufflers. Not only did we gain the most power, we were the only performance muffler to meet the 94 dB requirement (as measured according to SAE J1288), so you get more trail-legal power! 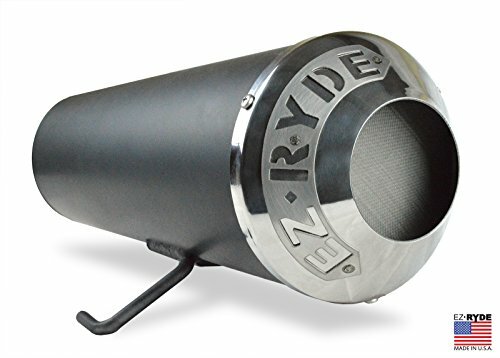 This muffler has better sound quality than all other performance mufflers at all operating conditions, is finished in Jet Black Ceramic Coat, and has a polished tip and a removable spark arrestor. If you have any questions about this product by EZRyde, contact us by completing and submitting the form below. If you are looking for a specif part number, please include it with your message.